BUTTEGIRL has no current links. 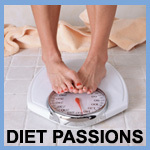 I need inspiration to lose weight I have tried lots of diets and have always failed. I really need to lose weight for better health. I am hoping that the members of this site can give me inspiration in losing weight.